Sandy Henderson, CEO of Rug Rats Fine Carpets and Custom Rugs, Inc., today announced that the 30-year old company will focus in the future on design and production of custom logo floor mats and rugs. "This portion of our business," stated Henderson, "has become increasingly lucrative for us as an online business. Our growing clientele from around the world has sought us out for quality, personalized, custom-designed rugs and mats. Sandy Henderson, CEO of Rug Rats Fine Carpets & Custom Rugs Inc, today announced that the 30-year-old company will focus in the future on design and production of custom logo floor mats and rugs. "This portion of our business," stated Henderson, "has become increasingly lucrative for us as an online business. Our growing clientele from around the world has sought us out for quality, personalized, custom-designed rugs and mats. 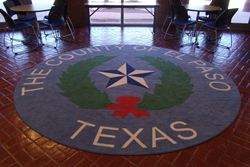 Commercial clients and organizations constantly request our logo rugs and mats as part of their promotion, point-of-purchase and branding strategies. Our individual and residential customers enjoy our custom rugs to personalize their homes, to celebrate special events and holidays, and to protect their floors and carpets with our beautiful and unique designs." Ironically, Henderson started Rug Rats in 1987 as a "kitchen-table" business in Farmville, Virginia, making and selling logo rugs for sororities and fraternities at her alma mater, Longwood University. Her clientele grew until a store and staff were necessary to meet the demand. During her 30 years in the business, Henderson and Rug Rats also became synonymous with the design and production of high-end, fine design carpets and custom rugs. But over the years, the custom logo rugs and mats remained the most-requested products and Henderson again switched the business model in 1998 to an exclusively online presence at http://www.rugratsva.com. Henderson continued, "As a business person, it's gratifying to know that my original business concept remains the one that our customers want most. We love designing and creating custom mats and rugs, and look forward to the positive results that the return to our origins will mean for Rug Rats and for our online customers." Founded in 1987, Rug Rats (http://www.rugratsva.com) provides custom carpet and area rug design and fabrication to interior designers, homeowners and businesses across the nation. The small town retailer based in Farmville, Virginia, built its local reputation for exceptional customer service and quality prior to launching its ecommerce services in 1992.